In my Antec SmartBlue 350W review I mentioned that a new fad among the industry are poorly constructed, high-wattage, pre-modded power-supplies that cost $20. 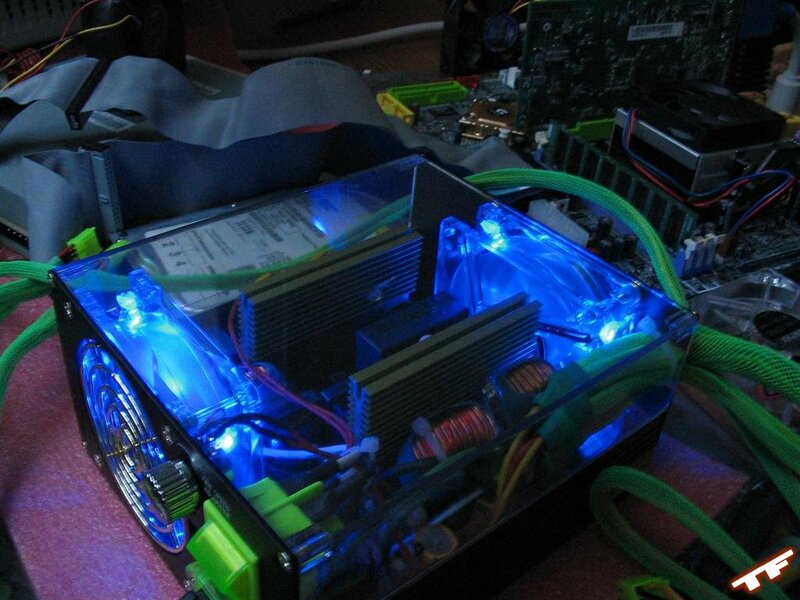 Unsuspecting builders are easily lured in by the glowing devices that claim that your computer will need/use all of the 500W+ it provides. 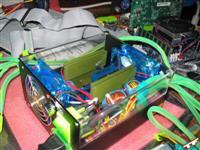 The truth is that a quality 300W PSU will still power my 3200+ system. There used to be only two categories for power-supplies: quality and crap. The latter category has now split up into: crap and crap that glows. Putting looks before quality can easily be the biggest mistake anyone can make. Enough with the rant, we all know lights are pretty and great and all that fun stuff, but how well do these power-supplies perform? 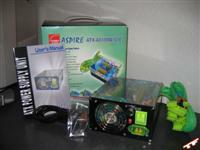 Today I review the Aspire AS500W 12V ATX power-supply. 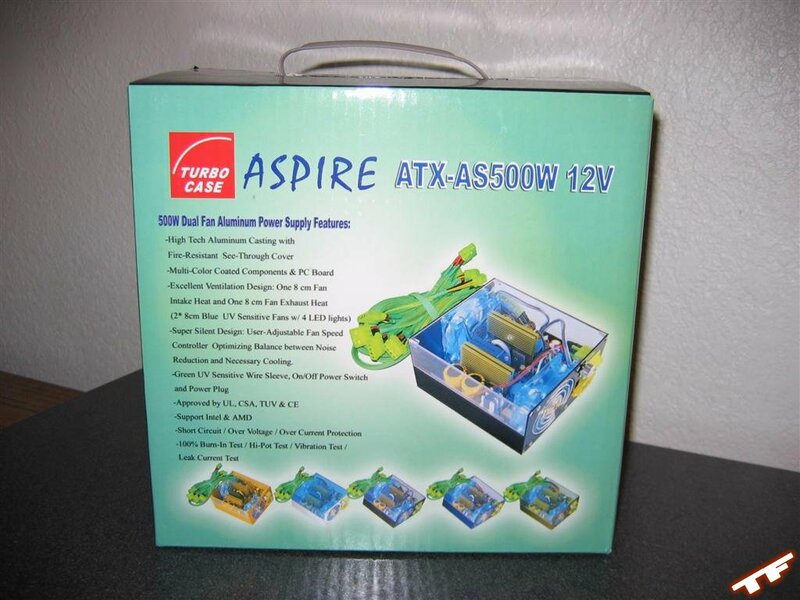 Aspire, according to their website manufactures a variety of cases, power-supplies, fans, keyboards and mice, I only know them for their cases (.. and now their power-supplies). 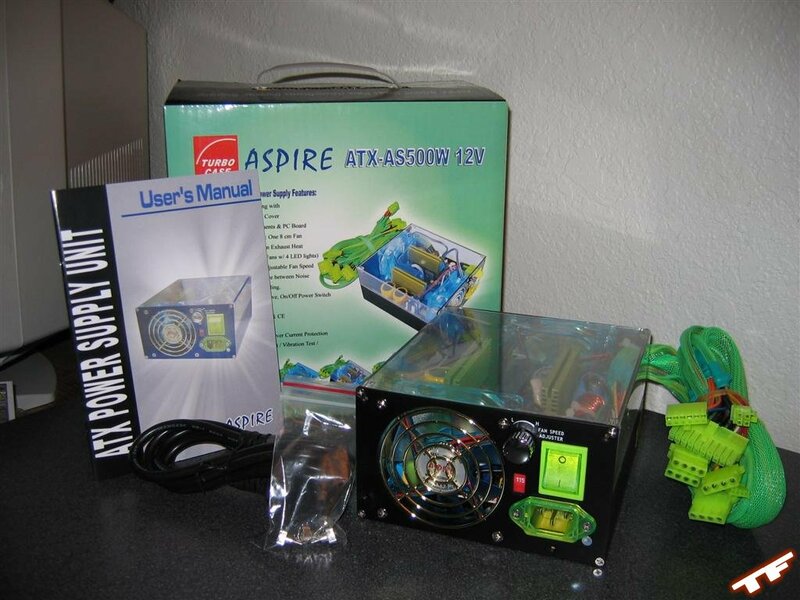 That being said, I wouldn't say Aspire has a well recognized name among computer enthusiasts but you can't miss their glowing, modded, power-supplies at retail stores. The Aspire AS500W is one of the $20 glowing power-supplies, so it was the perfect candidate to either prove or disprove my claims. 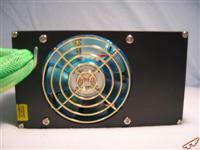 The Aspire AS500W 12V ATX power-supply comes in a dull lime-green color that reminds me of the color of 1960 bathroom tile. The box's color is not only ugly, it's almost repulsive. 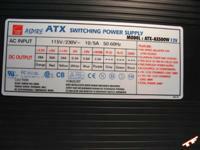 The front of the box has the AS500W's specifications, a glorified picture of the AS500W and a TurboCase logo. Does TurboCase own Aspire? I'm not sure and it probably doesn't matter in the long-run. The AS500W's box features a handle which would make sense if you ever needed to transport your power-supply without the case, if the PSU was hard to carry and weighed over 5lbs, but this is not the case. The handle is just more of a convenience factor for transporting the item while it is still new-in-box. Venturing inside the box, the AS500W is encased between two pieces of styrofoam and is next to a package of four thumbscrews and a four page manual. Back of the PSU Exciting shot, eh? Unlike the box, the actual AS500W unit is very appealing. 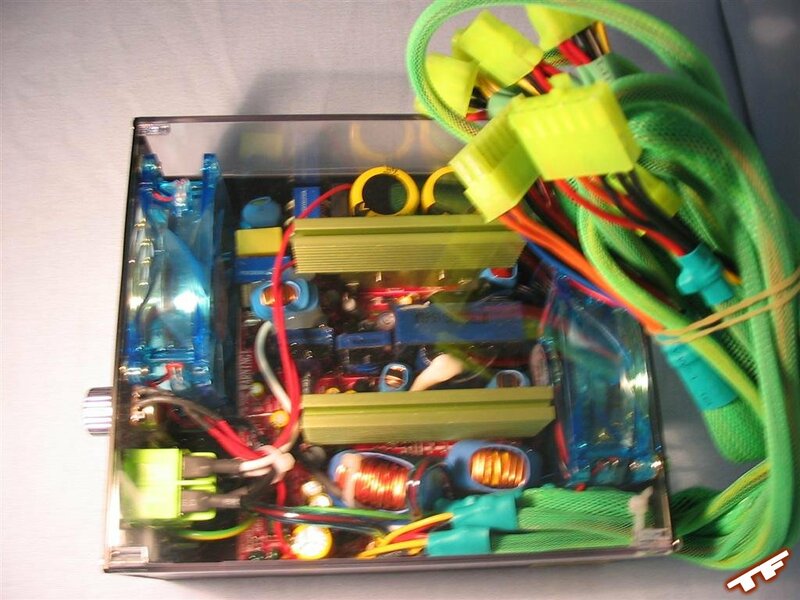 With half black metal, half clear acrylic casing, color-coated internal components and two blue 4 L.E.D fans makes this PSU just short of beautiful. There is no doubt that the AS500W is visually captivating; Aspire went to great lengths to prove their point, including almost every component of the PSU being a different color and the sleek UV reactive sleeving and molex connectors. 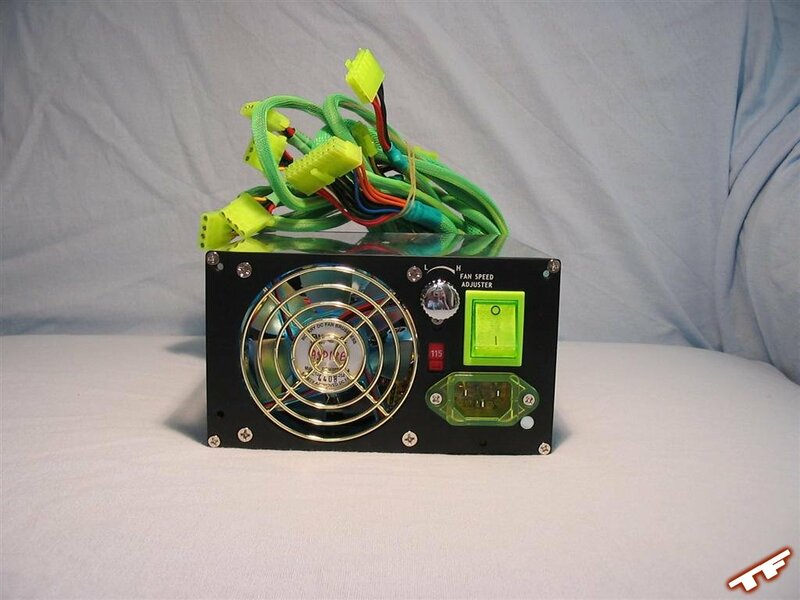 But there is more to a power-supply than a pretty face, the Aspire AS500W has a total of eight molex connectors, two floppy connectors, one twenty-pin ATX connector, one six-pin AUX connector and one four-pin 12V connector. Unfortunately, there are no SATA power connectors. Looking at the back of the unit, there is an 80mm exhaust fan, an AC input, an On/Off switch and a knob which controls both the intake and exhaust fans. Two things to notice about the On/Off switch, first of all, it's bigger and green, secondly, it feels and looks like it's made with extremely cheap plastic. It almost gives the feeling that you're turning on/off a child's play-toy. 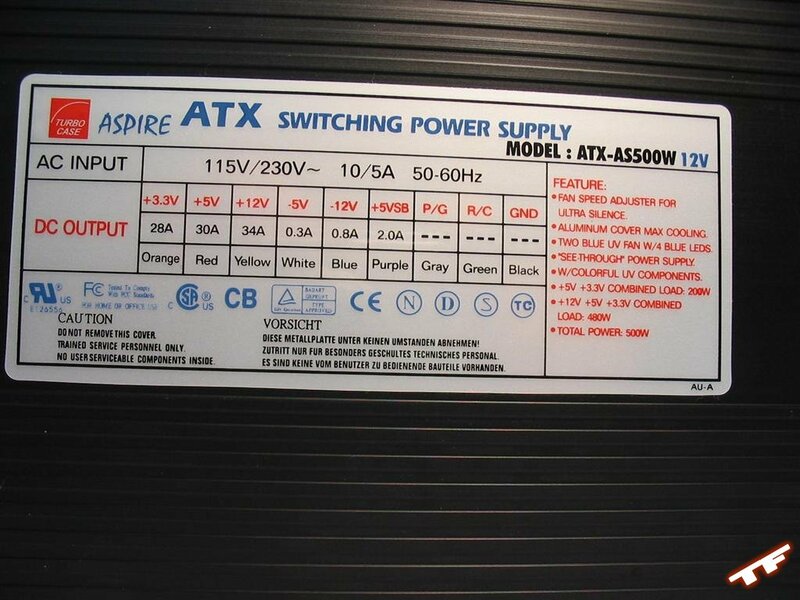 We've established the Aspire AS500W PSU is attractive, but how does it perform? Time to see if all those lights and color-coded components are worth trusting your system over. 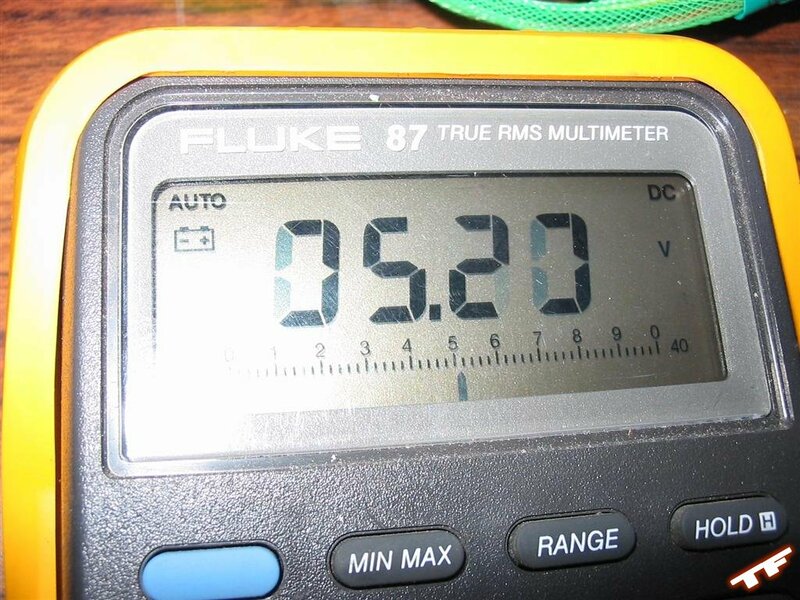 Using a Fluke 87 Multimeter which features an accuracy of � 0.05%, I measured the +12V and +5V rails from the molex connectors and the 3.3V rail from the 20pin ATX connector. For both tests, the fan speed was set to 100% via the knob on the back of the PSU. 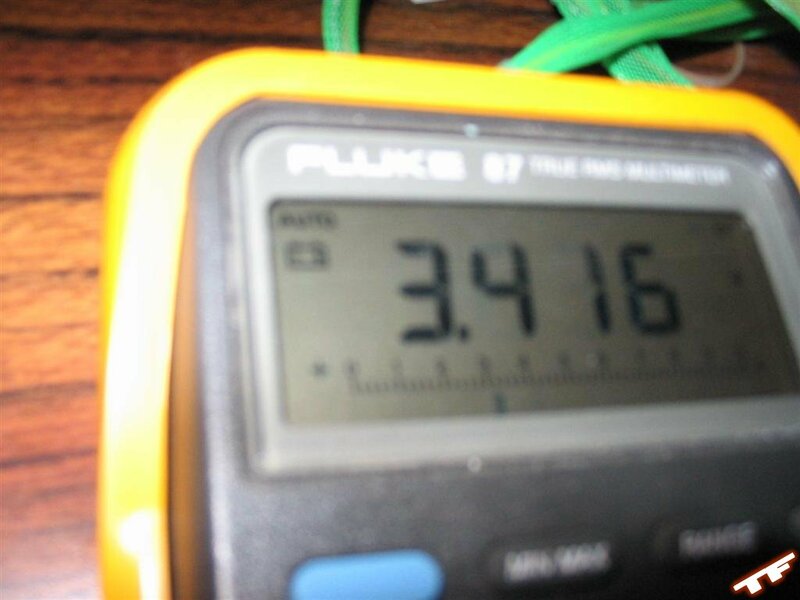 To test for idle rails, I used the paper-clip trick (PS-On, Ground) so there would be no load on the power-supply. To test for load rails, I connected everything listed in the Test Machine and ran Stress Prime 2004 for twelve hours and took that voltage. 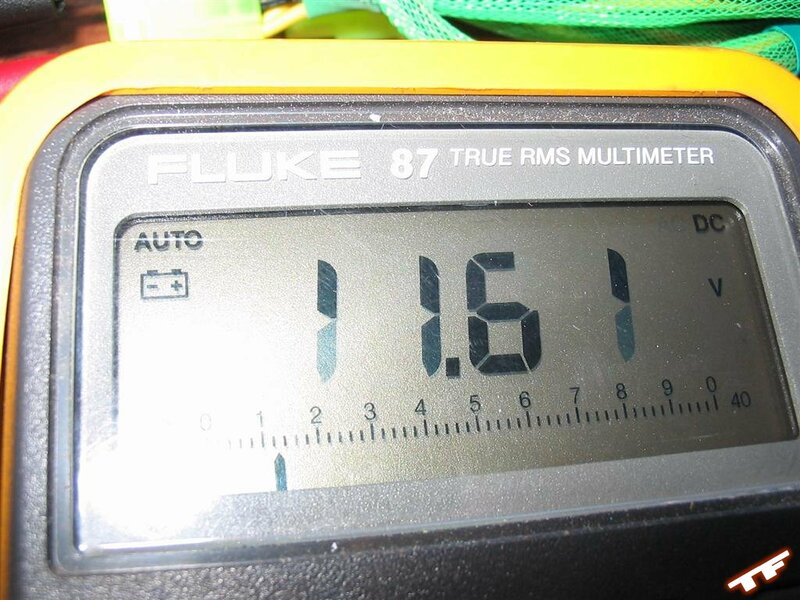 A little low at idle, it actually produced more accurately claimed voltages during load. Either way, so far, so good for the Aspire AS500W. 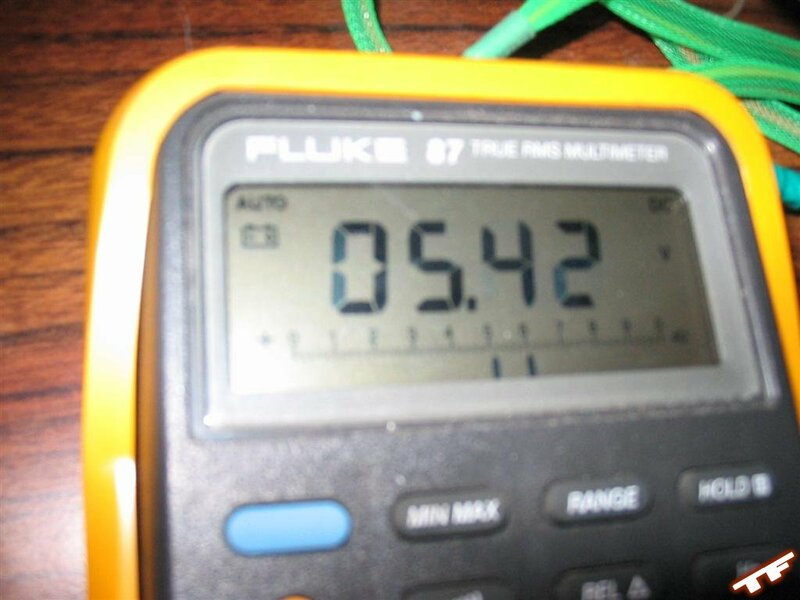 At idle, 5.20V was already very close to providing too much voltage through the +5V rail. 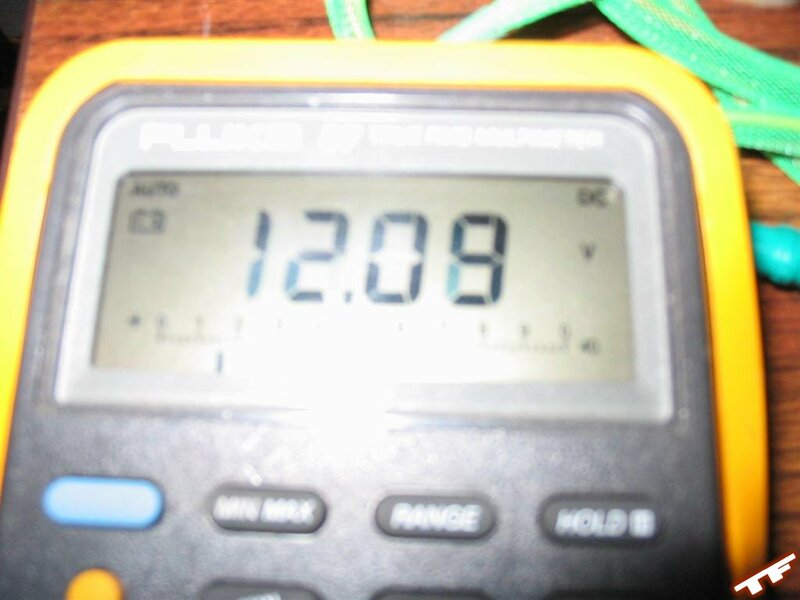 At load, it provided .22 more volts than allowed which is a scary thought. 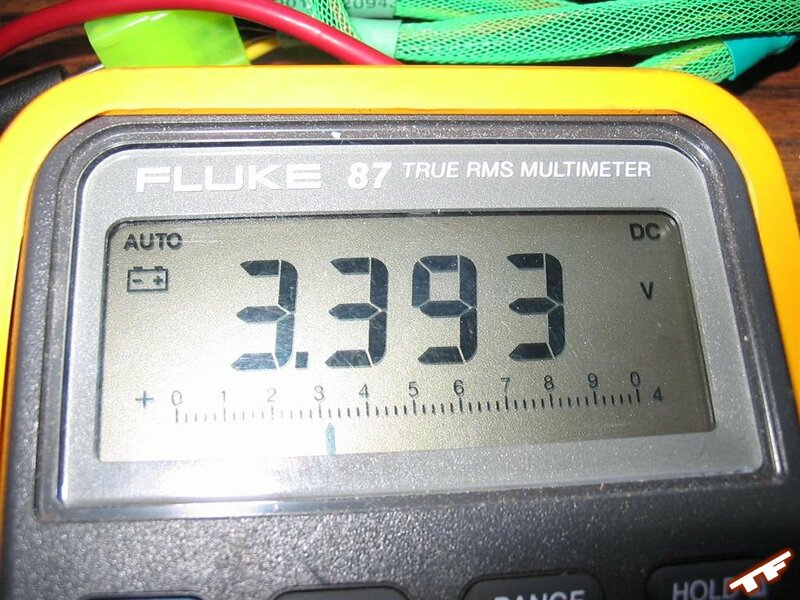 5.42V is a +8.4% difference from the advertised +5V. The most stable of the three rails, stayed within the tolerated allowance and barely changed voltages between idle and load. This is where we end up; while being visually appealing the Aspire AS500W falls short where it matters: performance. 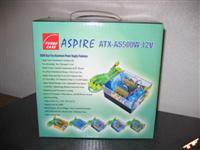 The Aspire AS500W has its good features, but nothing can out-weigh unstable and unsafe voltages. I would not trust this power-supply in my system; I hope you would choose the same. Other than the faulty rails, despite looking good, I was disappointed with the feel of the On/Off switch and the glow of the two L.E.D. fans is blocked by the internal components of the PSU. 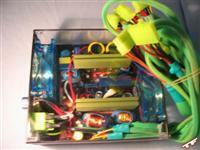 All-in-all, I can not recommend this power-supply to anyone because I can not recommend a faulty product. The only reason the AS500W scrapped a score of 2 is because during the 15 days of testing, I experienced no instabilities or problems even with the high voltage on the +5V rail.